Blurb Description: Sixteen-year-old Bentley Royce is the wild child of a super-glam reality TV dynasty. She has it all – designer clothes, a fancy school and an actual Bentley to drive around in. Her ambitious mum Mercedes has dragged the family from trailer park to Hollywood stardom. But Bentley wants out – she wants to go to college, escape her own storyline, be NORMAL – but Royces don't do normal (or college). 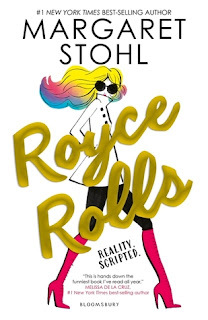 As I sit here, typing out this review a few days after I finished reading Royce Rolls, I’m realizing that I STILL don’t know what I feel. It took me a three days to get through the first half of this book, mostly because it took me a while to get used to everything about this book – the car names that the characters had, how disconnected they were and how much I struggled to connect with any one of them but the book did get better and I read the last half in a matter of two hours! 1. When I say the word Royce’s, think Kardashians. Royce Rolls opens with their reality show on Hiatus, and the renewal of their sixth season seriously in doubt. The family is in a state of panic, except for the middle child, Bentley Royce who just wants a normal life and to go to college. 4. Porshe (Bentley’s older Sister), Mercedes (Bentley’s mother) and Bach (Bentley’s Brother) were pretty much who I expected them to be and hence I actually enjoyed reading their hysterics and manipulations. Their dramatic lives were so Reality TV worthy! 5. I ABSOLUTELY ADORED THE ENDING. I didn’t expect to end on such a high note, to be honest but it was cute and more importantly, IT TOOK ME BY SURPRISE. I love Diego Sanchez and Asa and Venice and Bentley. It was this amazing ending which I didn’t expect from a book I wasn’t LOVING left me smiling as I closed the book. If you’re into hysterical manipulations, famous families and boatloads of drama Royce Rolls is probably the book for you. Margaret co-wrote the first of the internationally bestselling Beautiful Creatures novels (published in nearly fifty countries, named Amazon’s top teen book of 2009, short-listed for the ALA’s 2009 Morris award, and released as a feature film from Warner Brothers) on a dare from her three daughters, she fell even more in love with teen culture. Her first sci-fi series, Icons, is now in development as a feature film with Alcon Entertainment. Her Black Widow series from Disney Publishing (Black Widow: Forever Red and Black Widow: Red Vengeance) is a welcome chance to rock a strong female character and to return to her beloved Marvel roots. She is also writing the Mighty Captain Marvel comics. If asked, Margaret will tell you that the Women of Marvel panel at New York Comicon was the greatest single hour of her life, and that she fangirls all girls who read comics. As a co-founder of YALLFEST, the biggest YA book festival in the country, and its offspring YALLWEST, Margaret believes her readers are her kindred spirits and her tribe. Margaret lives in Santa Monica with her husband, who builds drones and robots, and her three daughters, who are competitive epee fencers—and who, like Natasha Romanov, have always known how to rescue themselves. Are you an avid watcher of Reality TV? What are some of your favourite shows? What are some of your favourite books turned into TV Shows? 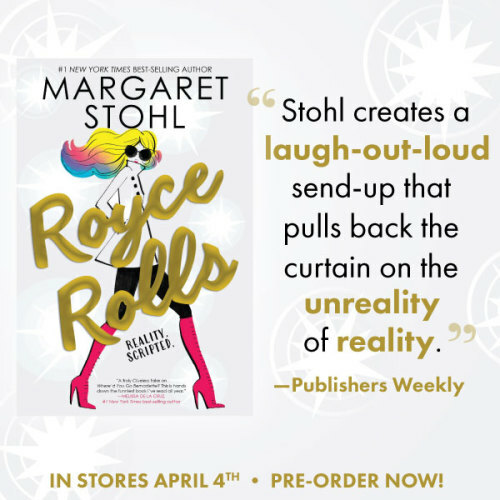 Have your read Rocye Rolls? What did you think of it?